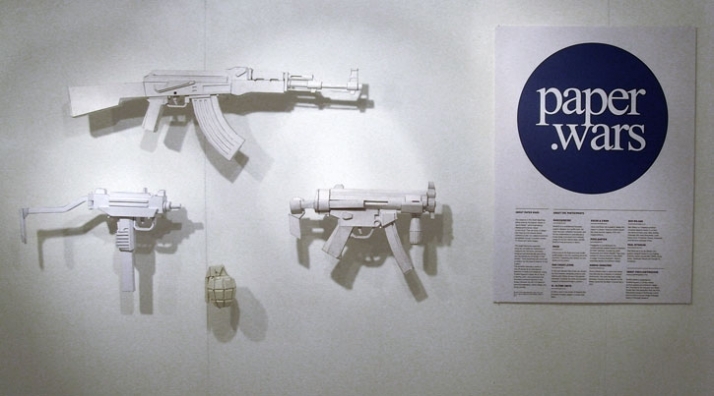 An exhibition of the Death Machines series of paper reproductions of classic weapons systems presented by PostlerFerguson (a London-based product, graphic and interaction design firm) at 253 Portobello Road's Craze Gallery, from the 15th - 21st of May. 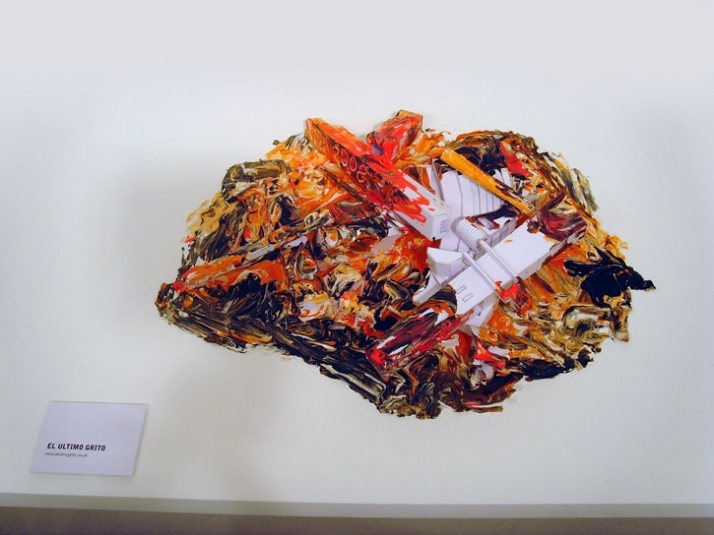 The exhibition featured a series of one-off pieces by an international selection of artists and designers. 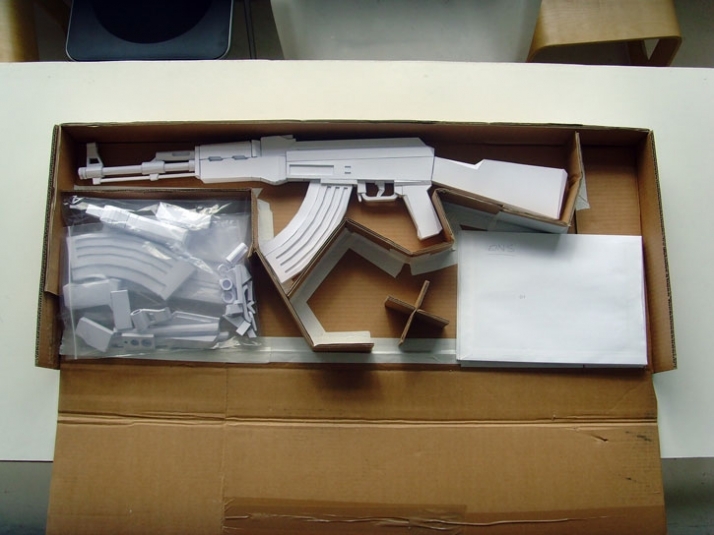 Using PostlerFerguson's paper AK-47 kit as a starting point, each participant has recorded a personal reaction to the tension between the AK-47's blend of seductive aesthetics, robust design and murky morality. Participants include Ben Wilson, El Ultimo Grito, Oscar and Ewan, Pixelgarten, Hiroko Shiratori, Paul Wysocan, Inkie, BASE23/DC|DE and more. 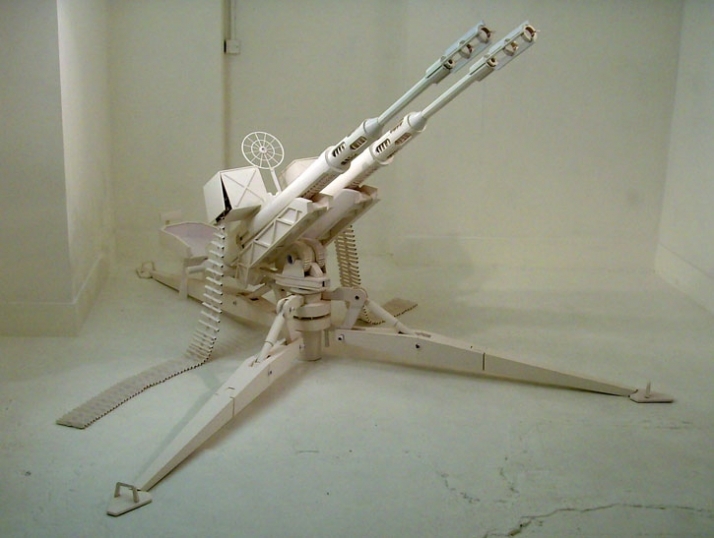 Also featured was a new addition to the Death Machines series, the Oerlikon anti-aircraft gun. First produced by the Swiss company Oerlikon Contraves in 1914, it was either sold to or stolen by all sides during WWI and WWII and continues to be used today. The weapons in the Death Machines series embody the highest values of “good design”; good engineering, reliable performance, robust construction. They are icons of design that have not only shaped global conflicts but also our collective aesthetic sensibilities through countless films, TV shows and news images. 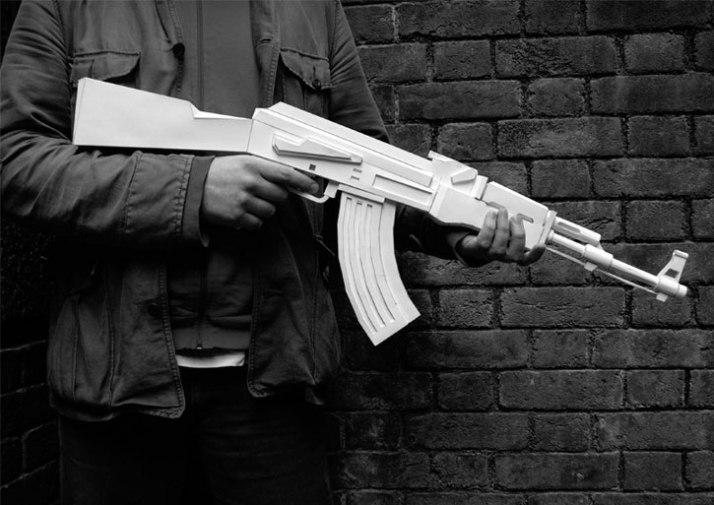 The Death Machines paper kits bring the contradictory experience of weapons into the home; admirably designed and aesthetically fascinating and simultaneously terrifyingly in their lethality. 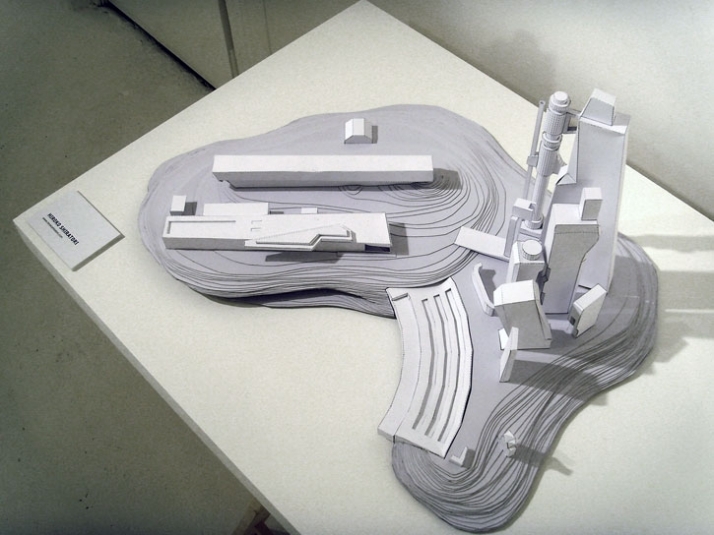 Each handmade part becomes a medium for the maker's reaction to the subject. 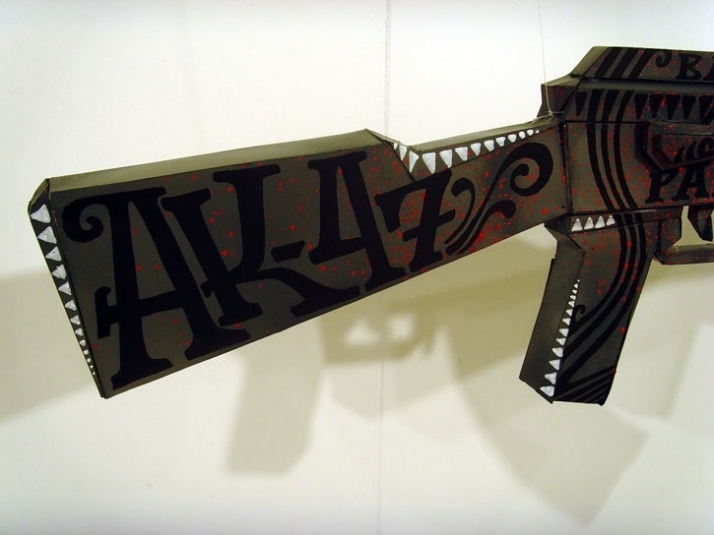 The first in the Death Machines series, the paper AK-47, was published by Die Gestalten Verlag in 2007. 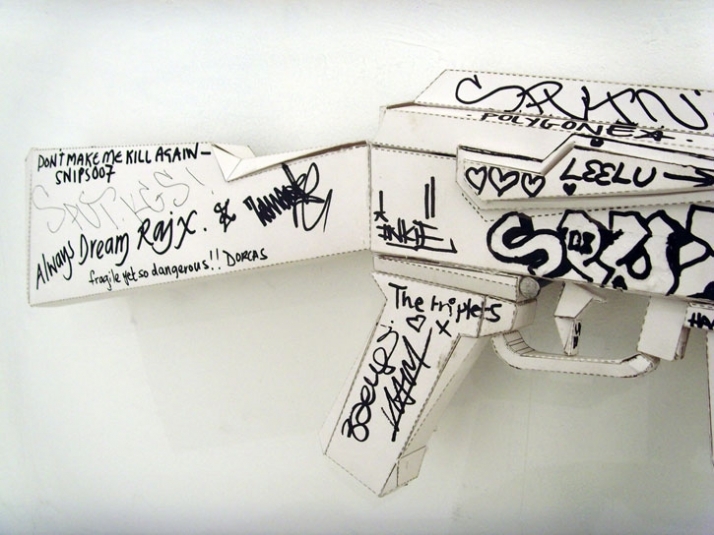 BASE23 is a multi talented illustrator, graphic designer and graffiti artist. His work has been exhibited worldwide, and he has collaborated on and directed a broad range of products from editorial design to his own fashion label, D|CIDE. BASE23 lives and works in Berlin. 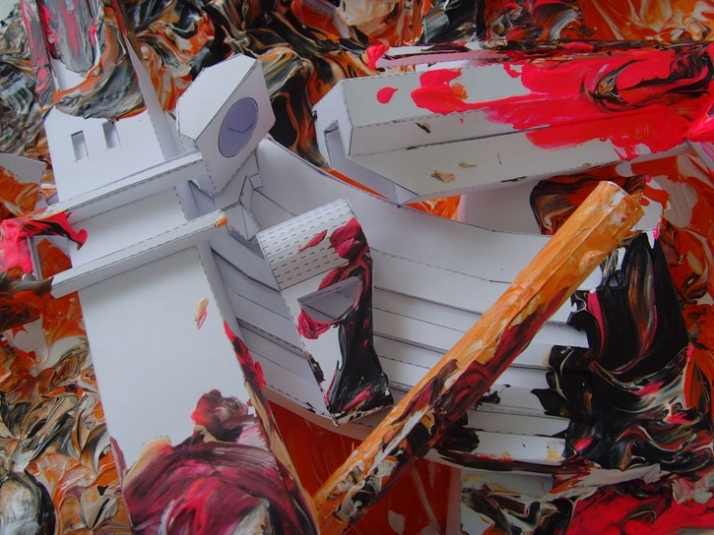 El Ultimo Grito is the studio of Roberto Feo & Rosario Hurtado, based in London and Berlin. Inkie is one of the finest and most prolific graffiti artists in the UK, operating since the mid-80's. 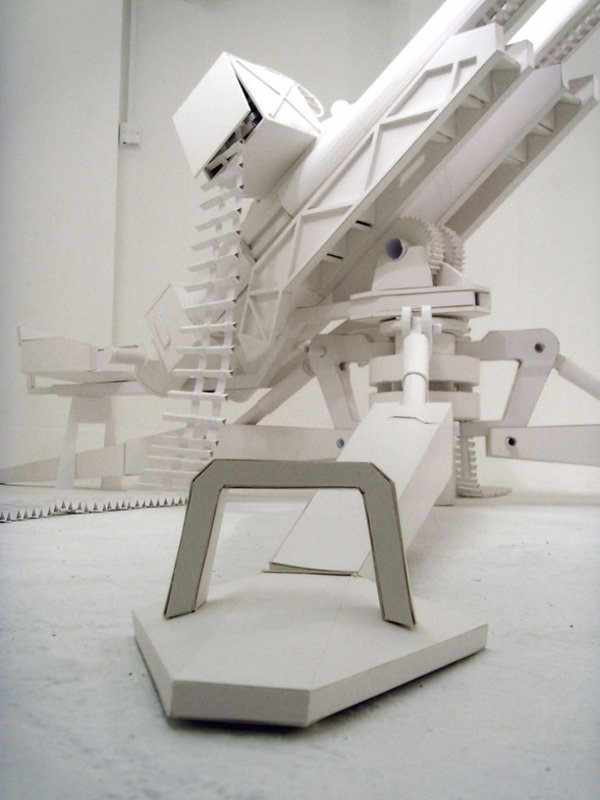 Originating from Bristol, he now works out of London. training with military forces in the tropical rainforest. Currently, he works as a product designer at SeymourPowell in London. Oscar and Ewan are a graphic design firm based in London. 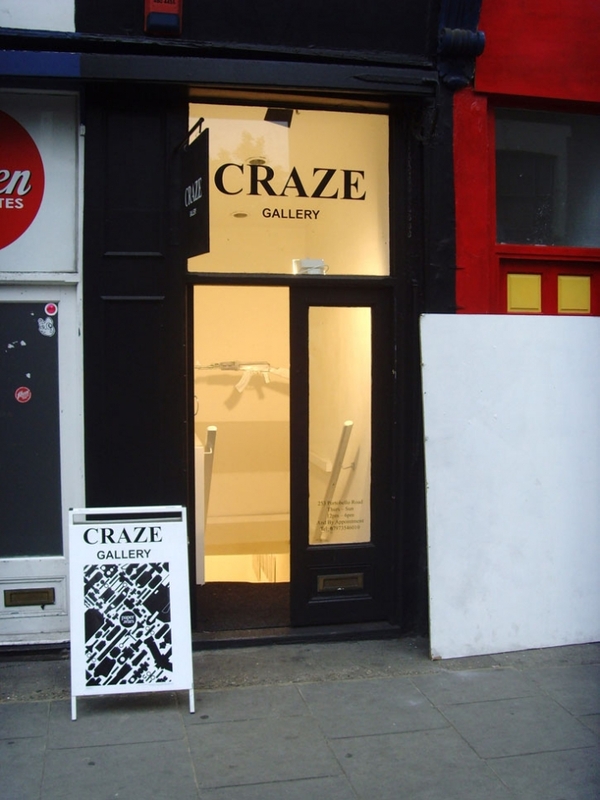 Previous clients include Big Dada records, Agency YCN, and Designersblock. for various clients in many fields of design including illustration, fashion, corporate identity and editorial design. 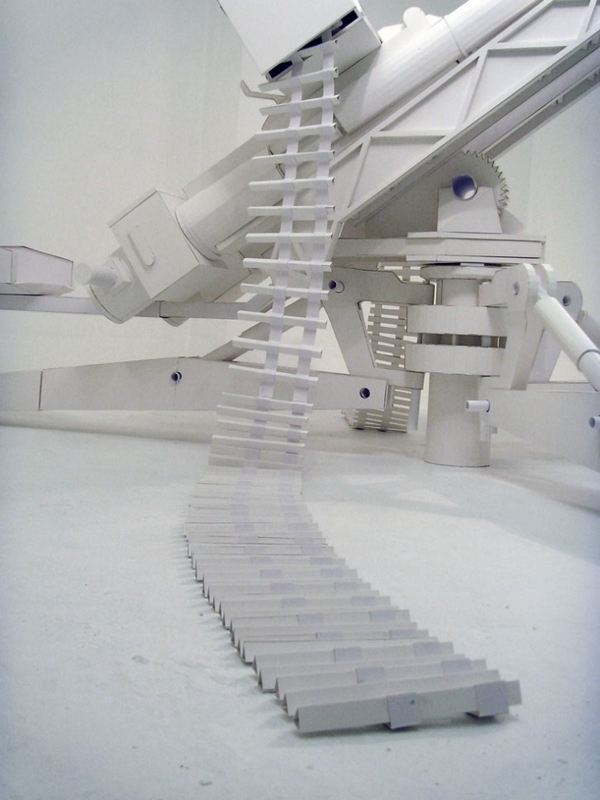 Hiroko Shiratori lives in Japan and works internationally as a member of London's OKAYstudio. 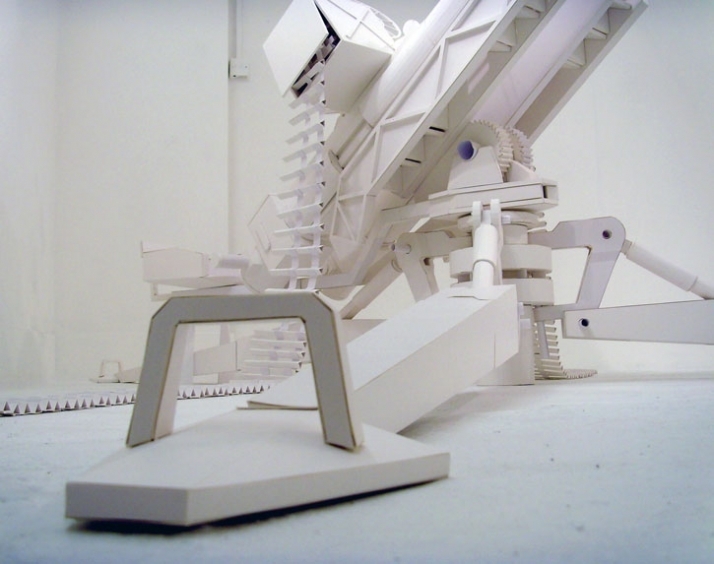 Her work has been exhibited internationally, including being featured by the British Council at the Milan Furniture Fair in 2007. 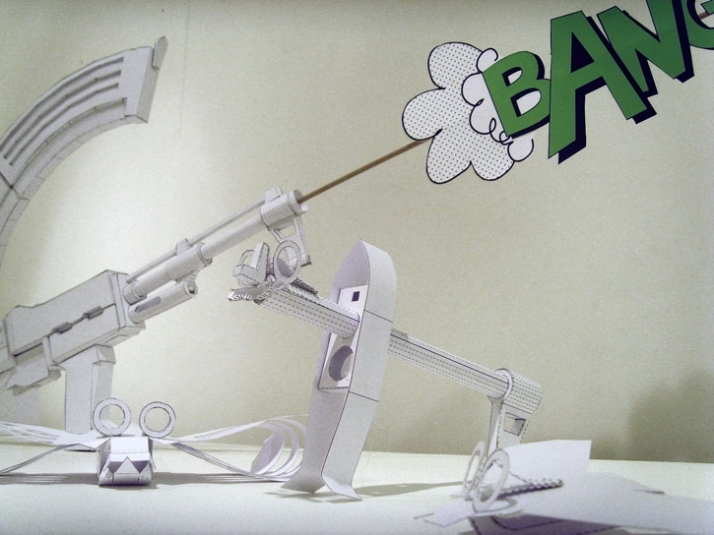 Ben Wilson is a freelance product/industrial designer based in London. His clients include Levis, Nike, Adidas, Artemide, Ron Arad Associates, Land Rover, Audi, Footlocker, Stussy, Swarovski and Olympus amongst others. Paul Wysocan is an art director and graphic designer based in Los Angeles. Previous clients include MAL/TBWA, Doug Aitken, Sarkissian Mason and George Yu Architects.